It’s been a little while since we posted anything on the blog. That’s because we were busy planning our three week US beer odyssey (of which, more later) and when we returned from our trip we had some physical and mental recovering to do. The other thing we’ve been doing is launching a new homebrew club at We Brought Beer in their newly opened shop in Clapham Junction. They don't just sell beer, they sell homebrew ingredients too. 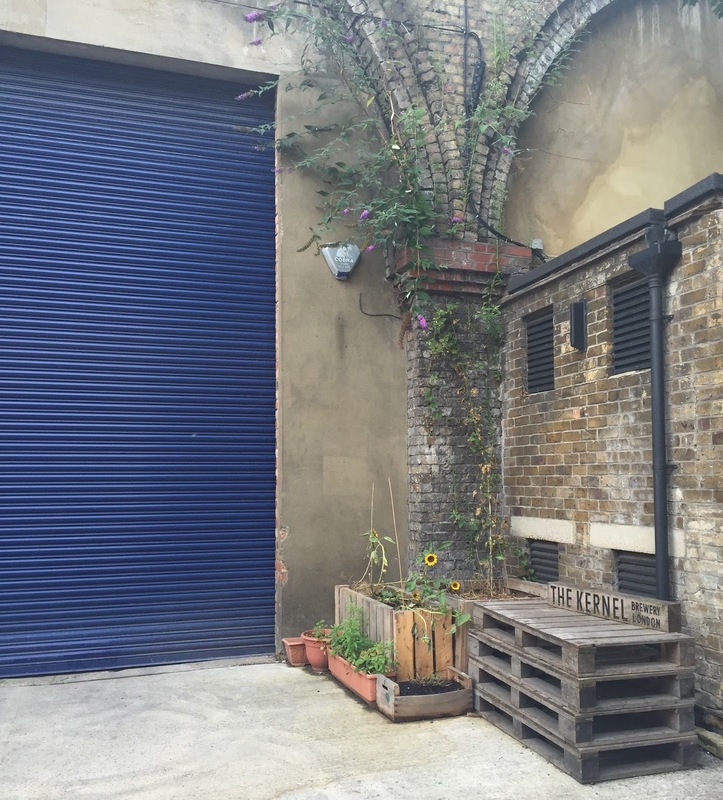 At Clapham they have a dedicated event space upstairs which is the perfect location for beer lovers to gather and get excited about brewing beer. We held the first meeting on Tuesday 17th November and we were surprised to see such a great turnout. It’s hard to know where to start with providing an ‘introduction to brewing’. Distilling a complicated subject down to its essence is always tricky. You could give a three hour lecture on malt and still not cover everything: but you have to start somewhere. The idea was to provide an overview of brewing ingredients, process and equipment, with separate sections on sanitation and temperature control. We might not be expert brewers but we are experienced and having made a few mistakes along the way we are happy to share what we've learned with people who are just starting out. On Saturday 21st November we did a live brew in the shop. This was the first time we had done an extract brew in three years. In fact it was only the second extract brew we’ve ever done*. The idea of this session was for people to be able to drop in and see what is involved and ask any questions they have about any aspect of homebrewing. We expect to do further one-off sessions on Saturdays in the future, and it’s likely the next one will feature all grain brewing. Next month’s meeting is on Tuesday 15th December, where we’ll be looking at recipe design and the use of specialty grains (within the context of extract brewing). In the New Year we’ll move on to more advanced topics such as the science of mashing in all grain brewing and critical appreciation of beer. Each session will start with a presentation before moving on to tasting beers. Further content will be guided by what club members would like to see. We're also looking forward to getting our brewing friends to come along and share their knowledge too, we already have a few of them pencilled in for future sessions (including judging beer, brewing imperial stouts with adjuncts, and making the move from homebrewing to professional brewing). The club is aimed at novice brewers – those who are yet to brew their first beer or who have only been brewing for a little while. Although we are of the opinion that one should never stop learning, even if you're an expert. The club aims to provide a forum where we can all exchange knowledge and opinion (and our beers too obviously). The joy of homebrewing is in discovery, learning and discussion. For more information on the homebrew club and other events at We Brought Beer follow them on Twitter for updates: @WeBroughtBeer. Any questions, queries or suggestions from club attendees can be sent to: homebrew@webroughtbeer.co.uk. *We popped in to dry hop the beer yesterday (it's a standard pale ale brewed with Centennial and Equinox). We should be able to package it next weekend. No idea how it will taste but we're curious to find out! The Bermondsey Beer Mile (BBM) means different things to different people. For serious beer geeks it was a precious little haven which some of them feel is now being ruined by what they refer to as 'hipsters' (in reality, if it is being ruined by anyone or anything (and I am not saying it is) it is its own popularity with more mainstream beer drinkers - far from the oft quoted definition of a 'hipster', in fact). For non-beer geeks, that is to say people who merely like beer rather than being obsessed by it, it is somewhere to go to try new beers and maybe visit the various foodie delights of the area. We could refer to this group as 'the Time Out crowd' although that might be a little unfair to some of them. but this group was certainly courted by those who looked to gain from promoting the BBM as "A Thing". Following hot on the heels of the non-beer geeks was a third group of punters wanting to 'do the mile' as a kind of pub crawl, often in large groups (sometimes in costume for stag and hen parties), often seemingly drunk when they got there. Breweries, beer styles even, didn't seem to mean anything to these people. It's not that they didn't know anything about the beers they were drinking: it's that they didn't care to learn. And so the BBM quickly transitioned from a place where you could casually wander around and visit a few different breweries to try their beers in a relaxed environment into a destination for alcohol consumption, with 30 minute queues to buy a drink, venues so full they are forced to operate a one in/one out system, and 'bouncers' stood outside on crowd control duty trying to make sure the local residents don't get too upset with the breweries. When Kernel changed their opening hours - to close at 2pm instead of 4pm there were complaints about how this would make it more difficult for people to do the BBM. People said how annoying it was that Kernel were in the middle of the 'mile' so you shouldn’t really have to start there (because obviously you wanted to go from one end to the other) but you were being forced to if you wanted to fit everything in. This seemed to really bother some people (complaints are not hard to find - but there are some examples here). Personally I thought: good for Kernel, why shouldn't their staff be able to have a weekend too? I've seen complaints about the earlier closing time where it was cited as the reason that the BBM is so crowded and manic and if only Kernel would stay open until 5 or 6pm everything would be fine because then everyone could do 'the mile' exactly how they wanted to and nobody would need to rush anywhere. So of course when Kernel announced that they had decided to stop opening their tap room completely people got even more annoyed about it. Instead of being grateful that for a few years they had been able to drink fresh Kernel beers right where they were brewed, people immediately started complaining about how the tap room closing will affect their ability to complete a pub crawl. People had been moaning about the queues, the overcrowding, and the 'lack of ambiance' for ages. The customers weren't happy with what they were being offered by Kernel. And the brewery weren't happy with what they were able to offer their customers. It was a lose-lose situation. It makes logical sense to say enough is enough and call it a day. But instead of people thinking, 'Let’s wait and see what Kernel are going offer us in the future', they criticise them for not expanding their business to 'meet the demand', i.e. the demand being people who want to drink at their tap room on a Saturday afternoon (even though they find the experience unsatisfactory and complain about it afterwards). What I find especially unfair is the presumption that Kernel are doing something unsound from a business point of view. As if a brewery’s key measure of success is their brewery tap rather than the beers they brew. 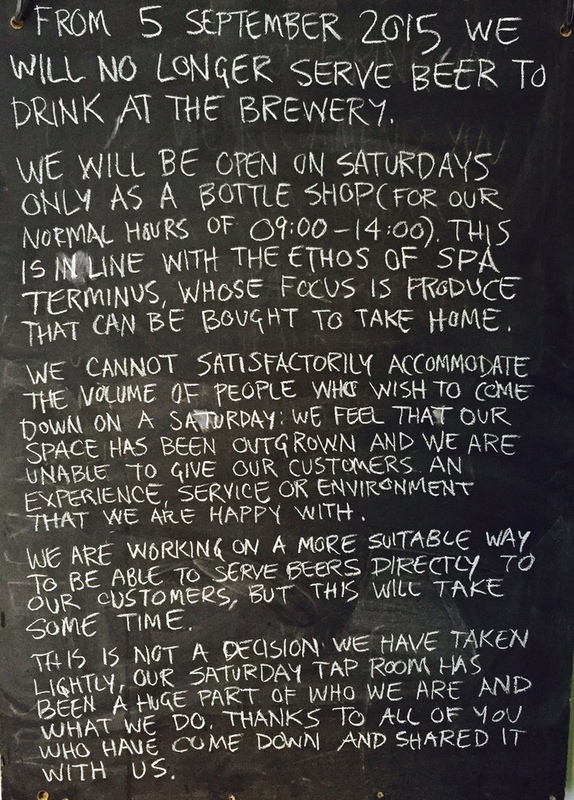 Some even fear the impact that the closure of the Kernel tap room could have on other breweries in the area and suggest it "could spell the end of BBM". At this point we don't even know what Kernel are planning to do next in terms of serving their beer directly to the public. So how can we know that it won’t be even better than what anyone else is offering from a brewery in Bermondsey right now? And it can only be better than what they were able to offer in their current circumstances. Personally I would love to see something along the lines of a Friends of Ham or Six Degrees North style establishment with lots of meat, cheese, and other foods that pair well with beer, where the vibe is closer to ‘eating food and tasting beer’ than ‘pub crawl’. 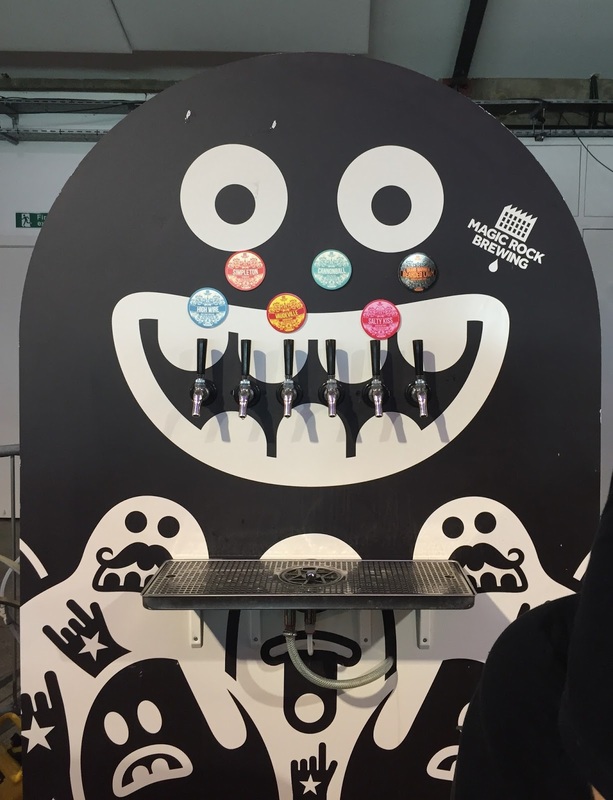 If you look north to the Magic Rock Tap you can see the obvious advantages of having a dedicated taproom, which is situated in a facility specifically designed for that purpose. It's a brewery tap which is managed like a bar rather than just an afterthought which evolved as an extension of the brewery and was run by brewery staff. I've heard nothing but praise for it since it opened a couple of months ago. But this is the opposite scenario to what Kernel were dealing with. This makes me wonder how other breweries (especially outside of the UK) have handled being too popular or having a tap room which is 'too busy'? 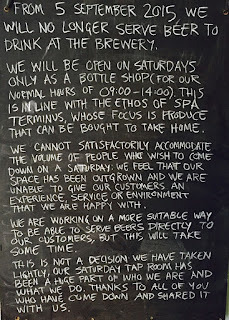 The general response to the announcement that the Kernel tap room was closing is indicative of the current atmosphere of entitlement where beer drinkers, in the UK but most especially in London, are so spoiled for choice (of breweries, beer styles, pubs, bars, etc.,) that their first instinct is to complain. Even when offered an explanation that makes perfect logical sense... they still complain. There really is no pleasing some people. "The brewery springs from the need to have more good beer. Beer deserving of a certain attention. Beer that forces you to confront and consider what you are drinking." I can't really blame them for closing their tap room when people behave like that. Can you? For the second year running London went mad for beer in the second week of August (even more mad than usual, I mean), and again this year there were far more London Beer City events on than you could possibly manage to attend. This time round we sat down with the programme and ticked off everything we were remotely interested in... but obviously that was still way too many. We ruthlessly whittled the list down to one or two events per day and cleared any non-beer related things from our diaries. And, maybe, most important of all: we cleared the entire final weekend so that we could spend it at home with the curtains drawn. Starting London Beer City a bit early we visited our local bottle shop, where there are usually four keg beers on tap for drinking at the shop or taking away in growlers of various sizes. In honour of LBC they had put on six casks from six different breweries to highlight the joy of cask ale and celebrate their first birthday (there would be even more casks on later in the week). On the night of the launch we got to take part in a (free) tasting event conducted by the brewing legend, Derek Prentice. As experienced homebrewers (and scientists by training and/or profession) we are familiar with the four ingredients of beer and how they are used, and we've stood or sat through many a talk on how beer is made. That said, I found it a pleasure to listen to a more ‘technical’ edition of this speech. 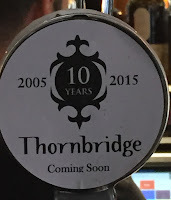 As well as brewing at a number of long standing breweries (e.g. Fullers and Trumans), Derek also teaches apprentice brewers who are studying for a brewing qualification. It was a pleasure and an honour to get to talk to him about beer and brewing. The cask beers were obviously of secondary interest to meeting Derek, but during the organised tasting we sampled Burning Sky Arise, Cloudwater Session IPA, and Wimbledon Tower Special Pale Ale. They were all good beers which we were happy to drink but the outright winner was the Wimbledon Tower (from Derek’s new brewing venture). It had everything you could want in a cask pale ale: a well balanced hop bitterness and malt character, and a thirst-quenching dry finish making you crave another sip. But the most notable thing about it was its vibrant fruity nose, for me it was peaches, but other people got soft red fruits. And where did all of this outrageous fruit come from? Dry hopping with Target (used along with two other British hops for bittering and flavour). I enjoyed this refreshing use of British hops - really nice to see in the current British brewing culture of 'Citra this' and 'Mosaic that'. If there was an influx of people who were there especially for the launch of LBC or whether it was just a typical Friday night in Shepherd’s Bush, I couldn’t really tell. Although when I was at the bar shortly before 6pm a group arrived who were there specifically to try Lizard Bride (a new BrewDog beer launching at 6pm that day), who were expressing mild embarrassment at themselves for having to wait for a beer to come on. But there was certainly a general air of good feeling when London Beer City organiser, Will Hawkes, jumped on the bar to introduce his week long programme of beer activity. Later on we won some prizes at beer bingo (although we were sad to miss the beer quiz at BDSB later in the week). It was a low key Friday night, but ideal preparation for the manic week ahead. It’s always a pleasure to catch up with our friends from out of town but yet again I’m left wondering why we bother with this event. Too many of the British cask beers I tried were just not in great condition and I find this really sad. Every year I keep hoping that I'll try some British cask beers which do not disappoint me but every year it's the same. The German beers were the best things we tasted at GBBF. As always I get sucked into trying stuff from the US cask bar but this is generally a hit and miss affair. In hindsight I wish we had just gone here instead of GBBF as the cask (and keg) beers were in better condition. If I had visitors in town from the US this year (as I have had for previous GBBFs) I would have just brought them here instead and said, "here is some great British beer for you to try." Plenty of variety in style with all of the consistency of quality you can expect from Thornbridge. With so many beers on tap I got to tick off a couple of Thornbridge beers which have been evading me for a while (Cocoa Wonderland and Bear State). Kernel, Partizan and Brew By Numbers came together to offer their beers to the general public on a weekday evening, this year it was the turn of BBNo to host. As anyone who has visited Bermondsey on a Saturday will be aware it gets busy down there, at times it is insanely busy. If you are bothered by big crowds (as I am these days) then you tend to limit your visits to Bermondsey, which is a shame because we’d like to spend more time drinking beers from Kernel, Partizan and BBNo at source. But on this occasion the queues for the bar were minimal or non-existent and we were even able to talk to the employees – who are usually run ragged and unable to stop for a chat. So for us this night was about great company first and foremost, with the beer was run a very close second. The beery highlights were the Kernel’s Mosaic Dry Stout (that magical mystery hop, which can be used in so many different ways and can seemingly do no wrong), and the BBNo 15|02 BIPA Citra. As someone who is fussy about black IPA as a style, who has had many a discussion with pro brewers and homebrewers and beer writers about it, this particular beer offered me an angle I’ve yet to experience with this beer style before: a fresh green hop character. One of the things I enjoy about a BIPA is how if the malt bill is done right then the beer still be enjoyable when the hop character has faded away a little (if not, it gets as stale as a standard IPA when the hops fade out). Sadly, I don’t get to witness this often enough as most BIPA are not quite ‘roasty’ enough for my liking. In fact this particular beer, 15|02, wasn't roasty enough but it had this amazing FRESHNESS OF GREEN HOPS to it that contrasted very nicely with the dark malts present. Obviously, that’s not going to persist too long – it was very much a ‘drink fresh’ moment. But I’m glad I was there to catch it. But the icing on the cake of this fantastic evening was the bottled BBNo 14|02 - a BA tripel, brewed with Wai-iti, one of my favourite hops: a zesty lemon fragranced delight from NZ. BBNo are well known for their saisons, of which they have produced many variants, and my favourite of all of those is the 01|08 Wai-iti. Saisons often have naturally occurring lemon aroma and flavour from the yeast but this hop really amped that beer up to a zesty wonder. I'd already bought a bottle of the 14|02 from the brewery when it was released and had been advised by them to age it a while yet. So when I was shown their fridge toward the end of the night and asked what I fancied trying I pointed at the 14|02 and said, ‘THAT ONE!’ It did not disappoint. If you’ve ever cooked lemons, as part of a savoury meal, to the point where they caramelise, become sweet and lose their bitterness but still retain the refreshing zing of a citrus fruit...well, that’s precisely what I got from this beer. A definite contender for my beer of the year so far. 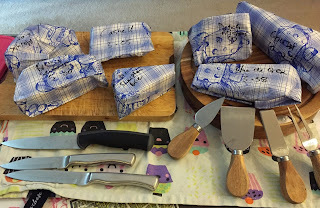 One event we really fancied doing during LBC was the beer and cheese matching sessions, but having recently held our own private beer and cheese event we couldn’t really justify the cost of us both attending a session with so much else going on. But another keen interest we have aside from cheese is coffee, which we love but feel like we know hardly anything about it. It seemed like the cost of the event could be justified in order to advance our knowledge. At the start of the event we learned how to taste coffee correctly (which similar to but not exactly the same as tasting beer - it makes a more unpleasant noise), starting off with a reminder that almost everything you taste is informed by its aroma. We then went through five paired rounds of blind tasting, first sampling the beer and voicing our thoughts and then doing the same for the coffee. Finally we were asked to vote on whether we preferred the beer or the coffee option from each pairing. The very first round (which I felt was a little bit of a cheat) was Carling vs Nescafe. The other rounds featured a wheat beer, a sour beer, a ‘hoppy porter’ (which we still feel we were correct to identify blind as a BIPA), and a stout – each beer was paired with a coffee which had similar or related elements to its flavour profile. This was a real eye opener and we’re really glad we did it. For example, prior to this experience I couldn’t quite have gotten my head round how you could pair a sour beer with a coffee. But you can! We went away feeling like beer is easy and simple (to deconstruct) while coffee is ultra subtle and nuanced with layers that we can’t even begin to approach at this point. Yet, we still feel like we learned a lot from this event and can begin to appreciate the enormous spectrum of what you are able to taste in a coffee. We will definitely be taking more time to over our coffee in the future and will begin to learn the basics of the myriad ways in which processing affects what ends up in your cup. The unlimited small pours (90ml) worked perfectly well. As far as I can see it is better for both the customer and person serving them if neither has to faff around with taking payment and I think that doing away with tokens all together is preferable. I’ve seen a complaint that the small pour does not encourage sensible drinking. This makes me think that there really is no pleasing some people. If you find yourself in a long conversation and your glass is dry you could either position yourself near a bar so that you can easily obtain another refill or *gasp* get yourself a glass full of water to drink while you’re chatting from one of the many water dispensing points. If someone cannot move away from the mindset of drinking pints to the point where drinking anything that isn't a pint bothers them, this type festival probably isn't for them. It's about trying lots of beers, not about how much you can drink. That concept goes beyond beer festivals too. For some of us, at least. 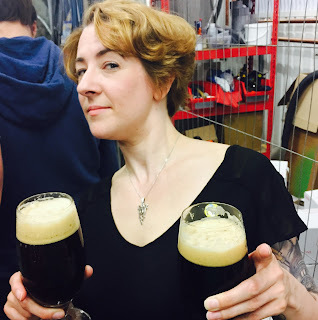 If you happen to be in town during London Beer City and you like beer (whether you live there or are just visiting) there are more beer-related activities on offer than you can actually physically go to. You will be spoiled for choice. Some events have an entry fee but many do not. If you enjoy matching beer and food there are a wide variety of options to choose from across a spectrum of budgets. If you enjoy meeting brewers, you're in luck: there are brewers all over the place just waiting to talk to you about their beers. If you want to learn more about brewing or even have go yourself, there are events to suit you. In short, there is so much variety (including lots of things I haven't even hinted at here) that there should be something to please everyone. In an effort to learn more about styles of cheese and to gain a better understanding of beer and cheese pairing we selected nine different beer styles and matched them with cheese. We gave these pairings our full attention and recorded our findings in detail. 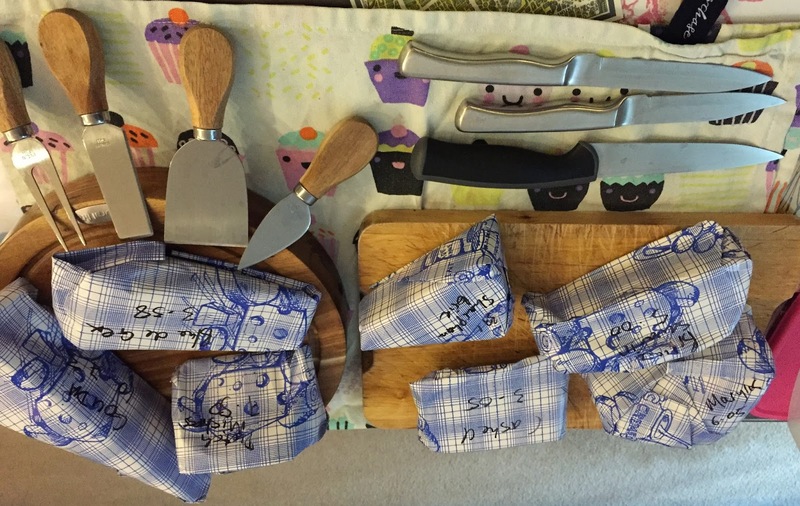 We reaffirmed our love of some Belgian beer styles and fell head over heels for aged Gouda and Brillat-Savarin. I’ve long been a lover of both beer and cheese. I eaten cheese while drinking beer plenty of times in the past but I’ve never really done it in a serious structured fashion before where I’ve put thought into it in advance. For my birthday last month I was given a book on matching beer and cheese (it was from Chris so I’m pretty sure there was an ulterior motive there) so that I might learn more about different styles of cheese. I read it in a frenzied, non-linear fashion, flicking around between the beer styles, staring longingly at the pictures. Very soon I’d cleared a day (possibly even a whole weekend) in our diaries which we could devote to the serious consideration of cheese and beer. I planned this event as a kind of luxury at-home experience and I was willing to pay for quality ingredients, maybe somewhere approaching what I’d be prepared to spend on a meal eaten at a restaurant. So, no, this it is not a cheap alternative to going out; I would consider it more like something you’d do to treat yourself or for a special occasion. I was aiming to have five or six courses but just in case I wasn’t able to easily source all the beer and/or cheese styles I was after I planned for extra courses just in case. I’m sure you know what I’m going to say next. Yes, we ended up all doing nine pairings in the end. A variety of different beer styles was what I was after for the pairings, especially those styles we don’t drink too often. From that list of selected beer styles I read through the suggested pairings for each. At the most basic level you’re looking for a cheese to compare or contrast with your beer. By the time I’d gone through the suggestions for each style I had a core of about six styles of cheese, most of which could be tried with each different beer. 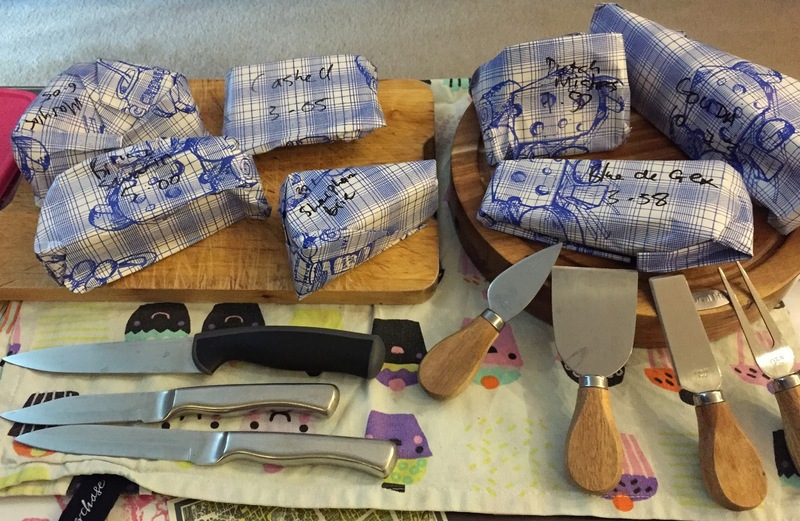 Once I my cheese wish list was complete I contacted our local cheese expert, Manish (from Good Taste Food in Gipsy Hill) to check if he could supply everything I wanted. As for the beers, we already had many of them in our beer cupboard but the rest I picked up on the Friday evening from BottleDog or Chris picked up on Saturday from We Brought Beer in Balham. On the Saturday morning I was positively giddy about going to get my cheeses, skipping off like Little Red Riding Hood with her basket. [NB I am actually eating cheese right now as I type this] I was pretty greedy with the portion sizes because I didn’t want us to run short during the event, plus I wanted leftover cheese too. The intention was for this to be done around the time of the evening meal but I confess that we just couldn't wait that long and started at about 4pm. See Table 1.0 for the pairings, by round, and the overall ‘winner’ of each round. The winner was the pairing which brought out the best in both the cheese and the beer. In most, but not all, cases we agreed on the winners. We had a few revelations during the tasting. The first was regarding the beers. Yes, of course we’ve drunk pilsners and Belgian beers plenty of times before. We know what they taste like, right? Well, what we did on this occasion was sit down with the beer at a table completely cleared of other distractions. We weren’t chatting to our mates in the pub or watching something on TV at the same time. We were really paying attention to the beer and giving it our full consideration. Our first thought was: blimey, we really don’t drink enough good pilsners. How often are we guilty of overlooking them for hoppier, more bitter beers? Then the dubbel and the tripel: wow. Doing this matching event really relit our fire for Belgian beers, both in their own right and as beers to pair with food. All the pairings were educational for us and I could easily go into detail on every single one. But to pick just a few of the most striking pairings – the most memorable for us both was probably the first round. Pilsner vs. Brillat-Savarin: this seems counter intuitive, putting a delicate ‘mild-mannered’ beer up against a super creamy, rich cheese that’s scarily high in fat. But it works incredibly well. The high carbonation of the dry, refreshing pilsner cleanses and refreshes the palate between each bite of the creamy cheese, literally washing away the fat of the triple cream. In turn the ever-so-slightly sour tang of the cheese brings out the malt flavour of the beer. This is a pairing which contrasts both textures and flavours. When I was sampling the cheeses before buying them Manish told me that the textbook pairing for Brillat-Savarin is champagne so I suppose it makes perfect sense for it to pair so well with a pilsner. The other two outstanding pairings were the Belgian beers. The dubbel with the aged Gouda was a match which made me smile a lot. This time it was a 'like pairs with like' match, with the sweet caramel notes of the malts snuggling up to the nutty sweetness of the cheese. It was a caramel match made in heaven. The tripel and the rind-washed cheese was a match where two robust characters meet each other head on and neither one gives any ground. I’ve long been a fan of the funk of a rind-washed cheese, but it can be overwhelming. The slight alcohol heat and the slightly sweet malt flavours of the beer easily hold their own against the intensity of the farmyard funk of the cheese. The dry finish of the beer contrasts with the rich creamy texture of the cheese. So with this round we had a comparison and a contrast within the same pairing. Our love of beer and cheese was renewed and reinvigorated by this evening of indulgence. It definitely made me want to try new pairings but also just pay more attention to beer and food pairings in general. I’d definitely recommend it to anyone who enjoys beer (and likes cheese, obviously). Our event was pretty extravagant but you don’t need to have nine different courses! Even just choosing one or two beers to try with two cheeses would be a really good experience, especially if you choose beer styles you don’t often drink. Finally, I just cannot express how much I love Brillat-Savarin. What a cheese. It seems to pair with absolutely everything you put it next to. It’s magical. I will admit that the day after we did this we were completely cheesed off. We couldn't look a cheese in the eye, touch a cheese or even think about a cheese without feeling uncomfortable (this was a difficult day as the remaining bits of our fridge that weren't stuffed with beer and hops were occupied by cheese). I think this comes down to us having started our cheese-a-thon at 4pm... yet by 10pm, we were STILL eating cheese. We were simply overwhelmed and so far past cheese that we were Beyond Cheese. But after a 24 hour cheese break we were able to think favourably about it again and get on with finishing off the leftovers. 1. Fletcher, Jane. Cheese & Beer. Kansas City, Andrews McMeel Publishing, 2013.